The assumption since the Pistons hired Stan Van Gundy was that he took the job to implement his 4-out, 1-in offensive system centered on Andre Drummond. To do so, the team would need spot up shooters, of which the roster was bereft of last season. With the exception of Kyle Singler, who according to Synergy Sports shot 41.7% in spot-up situations, the team had very few options on the outside. You all know what happened with Josh Smith, KCP struggled with consistency, and Brandon Jennings dominated the ball too much to function as a spot-up sniper. 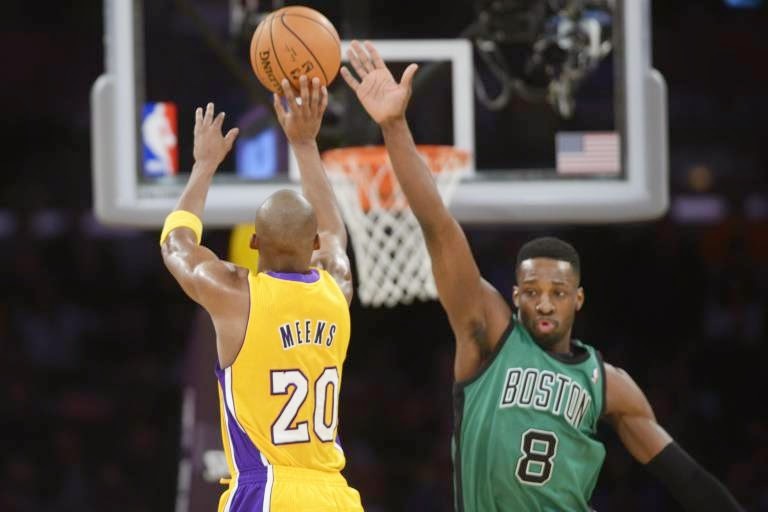 Enter Jodie Meeks, the Lakers' erstwhile shooting guard who saw career numbers across the board last season playing in Mike D'Antoni's wide-open offensive system. With the Pistons, there will be less running and gunning, but if SVG's prior offenses are any indication, there will be plenty of opportunities for Meeks to get looks. Meeks took 404 three pointers last season (tied for 20th most taken) and shot 40.1% on those attempts. On his spot up looks (203 in total from beyond the arc), Meeks shot 44.3% from outside. The point is, Meeks knows his role on this team. In other words, it looks almost identical to how it did last year with a few upgrades to the role players. Including Chauncey Billups, the Pistons currently have 16 men on their roster (following the signing of Cartier Martin). I don't believe there's any way Billups sticks around for the final year of his contract. If he does, it likely won't be with the Pistons, as I assume SVG doesn't feel any loyalty to a player he's never coached. Still, if Billups does remain with the team, Siva seems like the player most likely not to make the cut. The Pistons' best case scenario for fixing this roster is via trade. The rumblings lately have been that the Pistons are making a play for Sacramento's Isaiah Thomas. Signing him outright as a free agent doesn't make much sense, but trades have been wistfully floated. The key trade piece mentioned has been Josh Smith (this is cobbled together from rumors of the Kings' interest in Smith and the Pistons' interest in Thomas). Smith isn't as bad as he performed last season, but either he or Monroe needs to find a new home. While I would be upset paying Monroe $15 million a year, his upside trumps Smith's at this point of their respective careers. The key to the Meeks signing, in my opinion, is KCP's ability to play small forward when Singler needs a rest. Gigi Datome proved last year that he's not ready significant minutes in an NBA uniform, least of all guard some of the wing players in the league. Meanwhile, with KCP's athleticism and speed, he's able to go toe-to-toe with many of the small forwards around the league (I'm thinking specifically of when he shut down Paul George for an entire game, prior to the All Star break when the Pacers summarily imploded). Meeks' experience and consistency will likely earn him the starting nod at shooting guard barring a massive improvement from KCP this summer. Moving Smith allows Singler to slide into his natural position at small forward. Meanwhile, Thomas, KCP, and Dinwiddie could provide a much-needed punch off the bench. Smith's contract could be hard to move, however. If he remains on the roster, SVG seems smart enough to move him to the bench behind Greg Monroe at PF and deal with the ego explosion that comes. Even without Thomas, Singler moving to SF with Meeks at SG will give the Pistons ample offensive firepower and properly stretch the floor for Monroe and Drummond to work inside. If Meeks proves to be too significant of a defensive downgrade, KCP can slot into the starting role. The lynchpin of that 2009 Orlando Magic team--SVG's most famous and successful--was the duo of 6'10" forwards Hedo Turkoglu and Rashard Lewis, stretching the floor while also defending with length. The Magic were able to surround Howard with size and shooting, something the Pistons can't do. Meeks is a defensive liability and at 6'5" doesn't have a ton of upside. However, SVG has been able to coax the best out of role players, and Meeks could find his niche on the defensive end. However, playing alongside Brandon Jennings will do him no favors. Jennings, Meeks, Singler, and Monroe could prove hazardous for the Pistons' starting rotation. All are subpar individual defenders and, much as he's a budding star, Drummond is nowhere near the defensive player that Howard was/is. The starting shooting guard and small forward roles will be occupied by some combination of KCP, Meeks, and Singler, only one of whom is a good defender, and none of whom have ideal NBA size for their natural position. With few small forward free agents on the market with interest in Detroit, best case scenario here remains SVG's ability to cobble together a defensive system that can make up for weak individual perimeter defense. The Meeks signing is not without problems: his defense, prior to last season he never shot over 40% from outside--though he came close a few times--and even with a career season, his PER didn't reach 15. Paying him almost $7 million a year is a reach, especially with the current composition of the Pistons' roster. But SVG needs shooting and Meeks should be able to provide that. With the salary cap ballooning and shooting becoming a premium, if the Pistons can snag a young SG with upside now, it could prove to offer significant savings down the line. Besides, the Pistons won't hit a real salary crunch for quite a while. When Drummond is up for an extension, Billups, Datome, and Jerebko will be off the books, and Brandon Jennings will be on the last year of his contract and a highly valuable trade asset. Potentially dumping Smith for a cheaper contract in Thomas would further alleviate costs. If Meeks can shoot at least 40% from downtown throughout his contract, he'll prove to be a valuable addition to the team.